On Sunday night musicians from across the world attended the glamorous 60th Grammy Awards, which were hosted by James Corden. 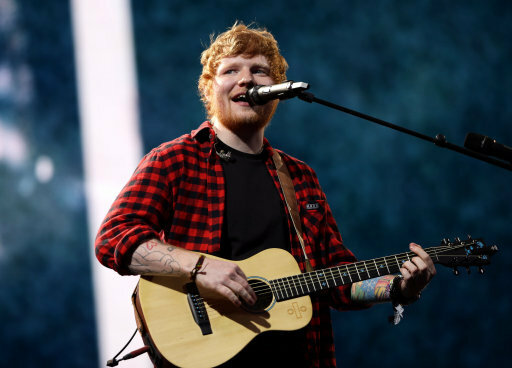 Of course Ed Sheeran was never going to walk away without a Grammy and so it was of no surprise to anyone, his name was called out as the winner of Best Pop Solo Performance for Shape Of You and Best Pop Vocal Album. However, Ed himself wasn’t there to collect the award and didn’t even provide a winner’s speech, forcing the announcers to come up with an excuse for the singer on the spot. Fans, naturally, were left confused by the young star’s notable absence, questioning why Ed was missing. Ed Sheeran is a no-show. He should change his name to Ed Disappearin’! Congrats to Ed Sheeran to be honest I think he was a no show because he’s embarrassed and/or doesn’t want to in the POP music category – Shape of You. Ed Sheeran a no show at the Grammys? Guess he can find his trophy in lost and found after the show.
.@edsheeran a no show at the #GRAMMYs ??? Guess he can find his trophy in lost and found after the show. ? With speculation rife, the 26-year-old singer decided to shut down the rumours, taking to Instagram to explain why he was missing. According to Ed he was absent from the showbiz bash because he was asleep. Woke up to the news I won two Grammys last night. Thank you! This little fluff-ball is doing a bit of a celebratory dance, lots of love to everyone. Fans weren’t exactly happy though with Ed’s response, saying sleeping through the awards was a poor excuse. Poor Ed was also booed when he won for Shape of You as some felt, with the #MeToo movement being so important right now, it was inappropriate the winning song was one which ‘obsesses’ over the body of a woman. Kesha’s: Was raped and abused by her boss, FINALLY is able to put out an album reflecting her traumas. Lana: Puts out an album with genre-defying feature choices. Ed Sheeran: I love ur body girl, *bing bong*, you are so fineee. Grammys: I think we have a winner. Ed sheeran: I love ur body girl? *bing bong* U r so fineee ? lets fuckk? Grammys: I think we have a winner? Lady Gaga wrote Million Reasons in a healing process to recover from a severe heartbreak. Kesha wrote Praying after being through her literal worst nightmare. Ed Sheeran wrote Shape Of You about a club girl he was horny for. Congratulations Recording Academy. Thank you for this. However all the critics in the world can’t ruin Ed’s fantastic month – not only did he win a bunch of awards, but he also got engaged! He shared the news via an Instagram post earlier this month, posting a cute photo of him and his fiancee, Cherry Seaborn.